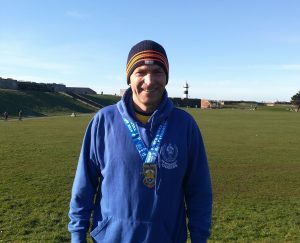 On Sunday, Greg Davis pulled out all the stops in the Portsmouth Coastal Half Marathon to secure first place of 75 in his MV55 age category and 16th of 725 runners overall. He clocked 1:27:18, which gave him an age grade of 78.73% and puts him 2nd to Paul Holley in the Jogger’s men’s club standards table for 2019. Also on Sunday, Mark Hayward competed in the Great Bentley Half Marathon, achieving a time of 1:22:33 and putting him 60th of 666 runners overall. Mark is now in full training for triathlon events and is juggling his time between all three disciplines, with running currently his strongest. Over at High Lodge in Thetford Forest on Saturday, Richard Jones and Clive Purbrook both ran in the Street Child Craft Half Marathon, with times of 1:38:57 and 1:45:40 respectively. They both beat their best half marathon times of 2018, with Richard in 5th position and Clive 16th of 68 runners overall. To add to the fun in this charity event, there was a free half pint of craft beer available at water stations every two miles, which could be exchanged for tokens and used afterwards at the “Halfter” après-run party. At the Great Barrow Challenge HQ, near Bury St Edmunds, it was the regular First-Sunday-of-the-Month 5K and 10K events, over hilly out & back trail routes this month. Andrew Taylor ran well in the 10K event in a time of 48:28 over the energy-sapping terrain, finishing 7th of 26 overall. In alternating fashion, next month the 5K and 10K races will be all on road for a fast PB route.